Cheurlin Brut Speciale is the winery’s flagship champagne. Is that former NBA Hall of Fame great Isiah Thomas now wearing the Cheurlin Champagne polo jersey? Yes, it is. And why not? Isiah Thomas with Lisa Marie-Booth, owner of Fortitude Health and Training, and Manchester (N.N.) Mayor Joyce Craig. Thomas, 57, is no stranger to the French bubbly – even if in an odd way. For years during his illustrious career with the Detroit Pistons (1981-94), Thomas said he enjoyed his share of wet, wild and elegant championship celebrations when “champagne was poured all over my head” – even if he didn’t drink it back them. 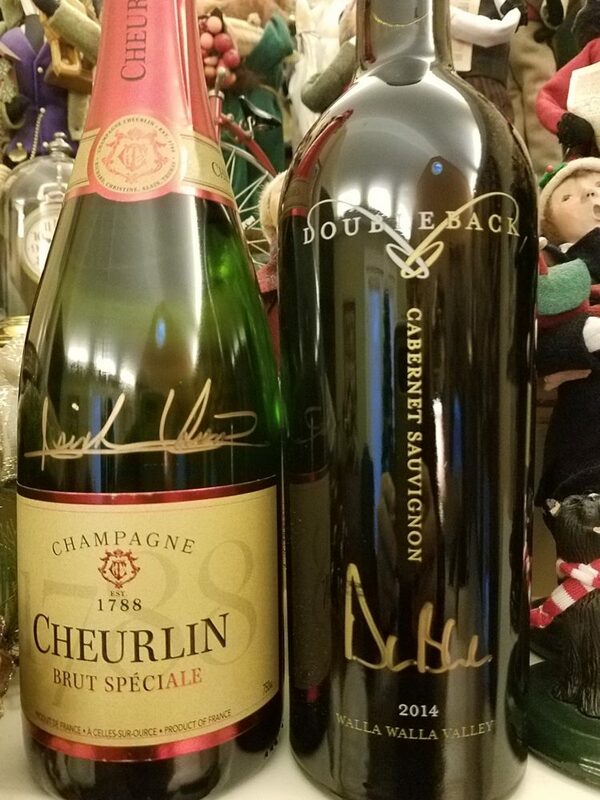 The Champions Christmas Wine Package: Isiah Thomas’ Champagne and Drew Bledsoe’s Cabernet Sauvignon. Bobby ‘BZ’ Zohn pours from his 90-point wine list at the Wine ConneXtion. Bobby “BZ” Zohn was back in North Andover last weekend at the Wine ConneXtion, pouring from his list of “90 points and above” wines based on ratings received from Wine Enthusiast and Decanter magazines and top-flight reviewers James Suckling and Robert Parker. Thanksgiving is truly an all-American holiday and, naturally, the pairing of food and wine should be all-American too. At least that’s what I used to think. Not anymore. We live in a melting pot of a nation, so why shouldn’t the holiday dinner table feature a melting pot of wines? With that said, here is a list of wines I’ll be considering for Thanksgiving and the upcoming Christmas and New Year’s holidays. Mumm Brut Prestige Napa Valley, $15.99: This sparkler is selling at a $6 discount in New Hampshire. It’s fruity with a hint of almond nuts on the long, dry finish. A great way to get the holiday started. Did Thanksgiving just sneak up on us this year? I don’t know about you, but I’m off by a week. To me, Thanksgiving always seemed to fall on the last Thursday of November but this year it arrives a week early — on Nov. 22. Whatever, it’s time for the annual Thanksgiving Day wine list from my experts, Andrea M. Lewis at Andover Classic Wines, located in the Shawsheen Plaza on Route 24, and Sam Messina of the Wine ConneXtion, located in the First and Main Plaza in North Andover. If you get a chance, stop by their outlets, which feature weekly wine tastings and a wonderful selection of American and international wines. When you think of the world’s great wine regions of the world, no one is going to jump up and shout “Umbria.” It’s neither No. 1 or for that matter No. 100. Yet it’s a gem of an undiscovered place. Umbria is central and southern Italy’s only landlocked region, bordered entirely by Tuscany to the north and west, Marche to the north and east ,and Lazio, which includes Rome, to the south. If star-crossed lovers Romeo and Juliet could have shared a final glass of wine, maybe they would have reached for Famiglia Pasqua’s Passione e Sentimento Rosso. It’s a red wine made from Corvina, Merlot and Croatina grapes grown in vineyards located not far from the Verona balcony where Juliet was serenaded by her lover in the courtyard below. Tourists still flock to the famous site and pin sentimental notes on the wall of the famous apartment building — something the local carabinieri are trying to stop by handing out fines of 300 euros. Ah, but traditions die hard in Italy, especially in this part of the Veneto, where passions for love and wine and beauty run so high. The Nesmith House was glamorous and full of life for the first class of “Vino Rosso: The Incomparable Red Wines of Northern Italy.” Nineteen enthusiastic oenophiles met Thursday in Lowell to learn about the four pillars of prestigious Italian wine – Super Tuscan, Chianti, Barolo and Brunello – from the Piemonte and Toscana regions. We also discussed the top red wine of the Veneto – Amarone della Valpolicella – which is one of my favorites. My “students” sampled seven wines which were paired with the Wine Goddess’ small plates of Italian treasures, including baked eggplant parmigiana and meatballs stuffed with spinach, mozzarella and Vidalia onions. The 2-hour evening came to a sweet conclusion when students toasted their success – each had to pass a 10-question final exam – with a glass of Vin Santo di Chianti Classico, a decadent dessert wine made from native Trebbiano Toscana and Malvasia Bianca grapes. As it that wasn’t enough, the Wine Goddess served homemade dried cherry and almond biscotti to resounding applause. So, as the Italians would say, we had some serious fun. The group asked some really good questions and amazed me with their keen senses of smell and taste. Most were spot on in deducing the basic aromatic and flavor profiles of the wines, and didn’t hesitate to delve deeper into the complex layers when presented with more structured, powerful bottlings. I was proud that they learned so well. For those who were shut out of this first class, a second has been added for Thursday, Nov. 8 at the same location. Contact Middlesex Community College to register, or go on the school’s website. I want to congratulate my students for their attentiveness, energy, and support. We couldn’t develop elegant wine education programs like this without your help. And the same goes for MCC and its staff, which brought this program to life and continues to support it with its own resources, including the fabulous Nesmith House location. This was our third wine class collaboration since last year, and we’re planning two special programs in the spring of 2019 – one on sparkling wines and the other on the ancient volcanic wines of southern Italy. Nero D’Avola, Nerello Mascarelli and Taurasi are just a few that come to mind. To show you that my students command the utmost respect, here are several exam questions they learned to master. If you don’t know the answer, you should take the class. Salute! The table is set for an evening of “The Incomparable Wines of Northern Italy,” a two-hour learning and tasting seminar at the elegant Nesmith House in Lowell, presented by yours truly as part of Middlesex Community College’s adult continuing-education program. Tonight’s class of 20 “students” is sold out; however, because of the number of inquiries received, MCC has graciously added another class scheduled for Thursday, Nov. 8, from 7 to 9 p.m. (To register, go to www.middlesex.mass.edu and type in “vino rosso” in the search button).